As a child of the ’90s when James Bond films first started to take the loud, bombastic, shoot-’em-all approach, it feels weird to watch a spy film in which not one bullet is fired. To be fair, “The Spy Gone North” is like the love child of a political thriller and a spy film, but director Yoon Jong-bin’s attempt to raise tension through words, not actions, is admirable and quite effective. The film is based on a real-life event that occurred during the 1990s, with the creators taking liberty with the fictional details. It starts by introducing a South Korean black operative who goes by the codename “Heukgeumseong,” played by Hwang Jung-min, and his mission to infiltrate one of the most heavily guarded and secluded countries in the world, North Korea. 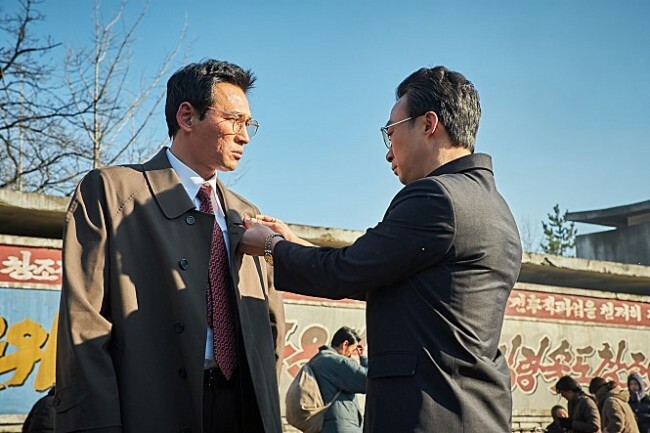 Disguising himself as a South Korean businessman, the spy soon gains the trust of a high-ranking North Korean official Lee Myeong-un -- played by Lee Sung-min -- and is even granted an audience with the North Korean leader at the time, Kim Jong-il. What stands out is the style. The camera pans between the actors from angles that show the complex emotions of the characters. Breathing life into the images is the superb acting of the actors. Hwang accurately depicts a seemingly approachable man wondering what it is that he is fighting for, and Cho Jin-woong -- playing his superior Choi Hak-seong -- brings the solid presence of a man trying to convince himself it is the right thing to do. Lee Sung-min’s character is complex in that he stands on the other side of the protagonist, but shares a perspective on the better future of the Korean Peninsula. The multidimensional nature of the characters, and the blurred line between good and evil, bring the characters to life, and their interaction is a joy to watch in a somewhat predictable plot. The way Kim was shot deserves mention. He is a hard man to depict in fiction, as he is often reduced to a cartoonish villain or a merciless psychopath for the convenience of the plot. What's done here is very impressive. The movie does not forget to show that he is the most revered, most feared person in the country. It does so through Lee’s reaction, who, despite being a charismatic figure, is reduced to a bumbling, scared idiot in front of the leader. The reaction is what makes Kim so scary despite the goofy hair and plump figure. Of course, the movie does not forget to leave a subtle clue to indicate that Kim is still an egotistical dictator. “The tragedy of South and North Korea persists and I wanted to ask, why is this still going on? What are we fighting for?” said director Yoon. The movie goes a step beyond the South-North standoff. A group of South Korean politicians conspiring with the North to win the presidential election “cause” a small border skirmish designed to raise security concerns among South Koreans. They assumed such fears would help them win the election against liberal candidate Kim Dae-jung whom they had been framing as a communist. For those not familiar with Korean history, this actually happened. An official of the presidential office and a couple of businessmen met with North Koreans in Beijing in 1997, ahead of the presidential election, and asked them to rain fire -- so to speak -- on the inter-Korean border. The accused had confessed that they conspired to do this, but later denied it. The lower court found them guilty of such charges, but an appellate court overturned the ruling by rejecting the confession -- as it was made without the presence of the defendants’ attorneys. The court did find them guilty of contacting North Korean officials to ask for armed action and sentenced them to prison terms, which was confirmed by the Supreme Court. The scene of South and North Koreans sitting together and conspiring over what to do in order to retain power shows that things are not always so black and white. Heukgeumseong, taught to regard all elements of the hermit kingdom as evil, sees the human side of the North Koreans through his interaction with them, extending his perspective to beyond what is presented to him. The flick looks at the event that occurred more than two decades ago, yet the message is strangely contemporary. The search for what is right and wrong is an eternal question. It is a movie that resonates inside you, touching off many thoughts, but also one that will probably have a hard time in the box office. “Along With the Gods: The Last 49 Days” opened this week to shatter all kinds of records with its visuals, humor and easy-to-follow message. “The Spy Gone North” is not one that you can kick back and enjoy. It makes you think, particularly about the issues still going on in Korean society. The film opens in theaters Wednesday.